The Learn to Solder: BigTime Watch Kit is an all-in-one kit that's helps you go from soldering noob to soldering guru. It contains all the materials and tools you'll need to assemble the kit, and, when you're finished, you can use the skills you learned to build even more kits. In this guide, we will do a quick rundown of all the items included in your kit, talk briefly about each one, and then show you how to put it all together. 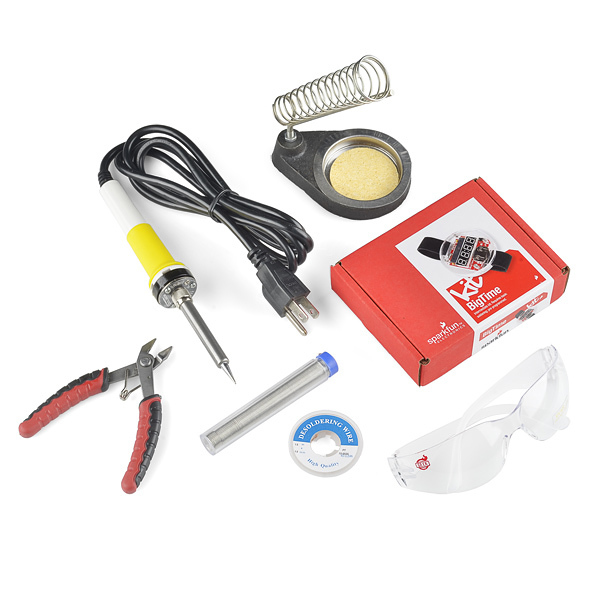 This kit is designed to be used by those who have never picked up a soldering iron in their life, and it's designed to be used by those who may just want to brush up on their soldering skills. Thus, no matter your skill level or age, the Learn to Solder: BigTime can be fun for all walks of life. Missing any parts? Sometimes one of those tiny little components can get misplaced. If you're missing any parts contact our customer service team, and we'll get you your parts in a jiffy. Rather than try and talk you through the assembly process, we are going to let our friend David Stillman show you how to build your BigTime in the following video. With that, you should have a fully-functional BigTime Watch ready to show off to your friends and family. If you have any questions or comments, please drop them in the box below. Happy soldering! Check out these other soldering related tutorials for more tips and tricks.